It occurred to me today, while I was reading some of Whitman’s great imaginative poems on a bike-ride stop, that using the power of the imagination is really the only way to overcome selfishness. To put it another way, people who can’t use their imagination are doomed to a meager life of selfishness. 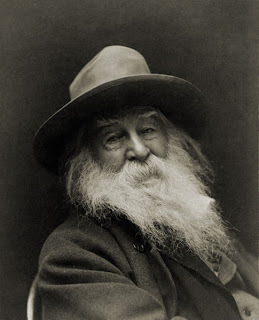 Whitman was a man of immense imagination. He was able to get out of “himself” – way, way out – so he could appreciate the immensity of the universe that he was a part of. His imagination helped him realize that he wasn’t simply a small, isolated “self”, but was part of an infinite cosmos (or Kosmos, as he wrote it) in which everything was a piece of everything else. In his visionary poems, he journeys through the entire universe, identifying himself with every object, animal, person, and power. He was them and they were him. There were no small selves, only one measureless Self. It was a universe completely devoid of petty selfishness, and only the imagination can help us find it. "To me, every hour of the light and dark is a miracle." " ... no sounds of contention, no raised voice, no abrupt bursts, no tread of violence, was ever heard; all proceeded in a regular course of cheerful orderliness; everybody had their due importance; everybody's feelings were consulted." "Dr. Strong's was an excellent school...It was very gravely and decorously ordered, and on a sound system; with an appeal, in everything, to the honor and good faith of the [students], and an avowed intention to rely on their possession of these qualities unless they proved themselves unworthy of it, which worked wonders. We all felt that we had a share in the management of the place, and in sustaining its character and dignity." "The agent spent his days in following what seemed to many observers to be only a dull routine, but all his steadiness of purpose, all his simple intentness, all his gifts of strategy and powers of foresight, and of turning an interruption into an opportunity, were brought to bear upon this dull routine with a keen pleasure."